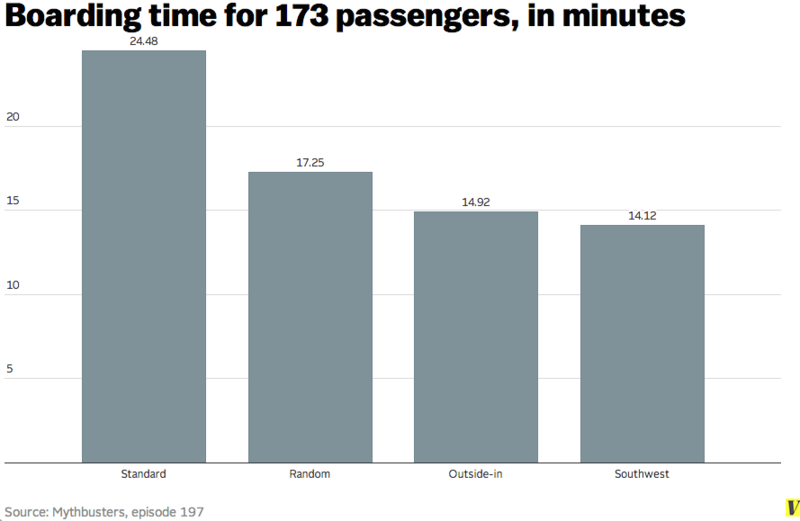 For years I have wondered why boarding a plane takes so much time. In most flights I have been on, there are 3 groups of people. First and Business class passengers, then families with young kids, old folks or disabilities, then finally all the economy class passengers. Most airlines follow a standard invitation scheme, where they invite the first 2 groups to board first, and then they invite economy passengers by row/section numbers. I, almost always in the last group, often get frustrated, trying to make my way to my assigned seat. Even after the plane arrives, and is ready for boarding, delay happens at multiple points. Boarding pass and passport checks (again) at the counter, then waiting for passengers ahead you, trying to push their oversized luggage into the overhead lockers, and then most frustratingly, waiting for aisle passengers to move out, while their window and middle seats neighbours, try to squeeze in. I understand the need for special treatment for the first two groups. Price discrimination for First/Business class is absolutely necessary and it cross subsidizes economy class tickets. Old folks and kids should be given priority. And I don't think these 2 groups generally make up more than 10-15% of all passengers. So how can we make the rest more efficient? In most airlines these days, there is a dimension limit for cabin luggage. They just need to be enforced strictly. And if passengers can assist each other, the luggage delays can be resolved. The more interesting issue is the one about order and passenger arrangement, which we'll explore further. At first glance, the most efficient invitation scheme for the economy class passengers would be calling window passengers first (Outside-In method), then middle and lastly aisle. It drastically cuts down aisle waiting time. The small downside is that people who are sitting together can't board together, a problem for families with children and couples who might have to separate briefly. I found out that US Airways already does this in a few sectors, though making exceptions for families. The other proposal, though not to my liking is open assignment (Southwest method). You get assigned a continuous sequence of numbers as you check in, which determines your boarding sequence. And once you board, you get to pick your seat on a first come first serve basis. 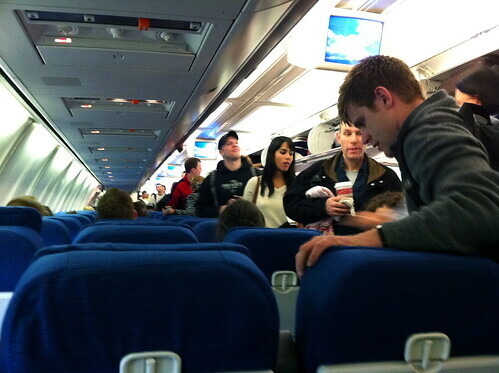 In a best case scenario, passengers automatically arrange themselves in a window first, middle and aisle scheme. In a worst case scenario, aisle gets occupied first, making it the most inefficient scheme. Southwest has this in a few sectors and it seems to work well because when passengers notice there's a line in front of you or someone's taking a long time to put their bag in the overhead lockers, you have the freedom to just sit down in the row you're standing near currently instead of waiting to get past. In doing so, you're clearing the aisle and making things faster for the people behind you. The downside of this method is that some people get stressed about the idea of having to choose their own seat and don't like checking in early for the chance to pick earlier. People also like to sit with friends and family, and passengers who pick their seat later on in the process might not find any blocks of open seats together. There are a few more interesting alternatives that vox.com explores in their article. How about a Random scheme, just letting people get on the plane in an order unrelated to their seats. Interestingly, United does this in a few sectors and it turns out to be slightly faster than the standard method. Reason being, rows are being staggered, so not everyone in a section are trying board together. This is how the various schemes perform, with the open-assignment performing the best in the best case scenario. The theoretically best performing scheme is Steffen's method which, a variation of outside-in, instead of allowing all window seat passengers to board first, creates a choreographed sequence within them to avoid any aisle-waiting at all, and could theoretically produce the most effective boarding scheme. It's quite clear that there are so many easy alternatives to the standard method. Shorter boarding time eventually saves money. Think of it, even if an average boarding time goes down by 10-15 mins, a short haul flight could make an extra trip every other day. One argument is that carriers are probably making more money than they can save by charging passengers for the unpleasantness either through more Business/First class tickets, or selling boarding priority addons (now charged in most budget airlines) to skip queues. I would like to see some financial evidence that supports this. It's easy to see that all passengers are worse off. Most of us are waiting in line longer than necessary, and even those who pay extra are sitting on planes longer than necessary. No one is getting to their destinations any faster. Every extra minute spent boarding, costs increase, everyone pays higher prices for tickets. And for the airplane carriers, if they aren't making more than what they could save, any boarding scheme would be a pareto improvement over the standard archaic one. Bon Voyage!